When we go from a lying down position to standing up, our blood tends to pool in our legs and has to fight against the force of gravity to travel our brain. Overcoming the force of gravity is the greatest challenge the cardiovascular system faces. Luckily for us, our body is able to detect when such changes are to occur and can effectively change blood pressure to compensate for the change in posture. The body has many different sensory inputs that contribute to homeostatic regulation of blood pressure during these postural changes. The vestibular system, baroreceptors, chemoreceptors, and higher order brain centers (hypothalamus and cerebral cortex) are all examples of the body’s many sensory inputs (Yates et al. 2014). If these homeostatic responses perform inadequately, then conditions such as orthostatic hypotension can be the result (Yates et al. 2017). Orthostatic hypotension results from a drop in blood pressure due to a change in posture, where insufficient perfusion of blood with the brain occurs. My research project this summer focused on the cardiovascular responses that are necessary to maintain normal biological homeostasis during anticipated imposed postural changes. Homeostasis is defined as the tendency of biological systems to maintain relatively constant conditions in the internal environment while continuously interacting with and adjusting to change originating within or outside of the system (The Free Dictionary, n.d.). In this study, my lab investigated the activity of neurons in the RVLM (rostral ventrolateral medulla), located in the brainstem, in awake adult female cats. There has been significant research to support the claim that neurons in the RVLM play in important role in blood pressure regulation in both animals and humans (Yates et al. 2017). RVLM neurons are necessary for cardiovascular responses to maintain homeostasis during postural movements. The neurons in the RVLM were identified by their changes in firing rate correlated with the cardiac cycle and their location. 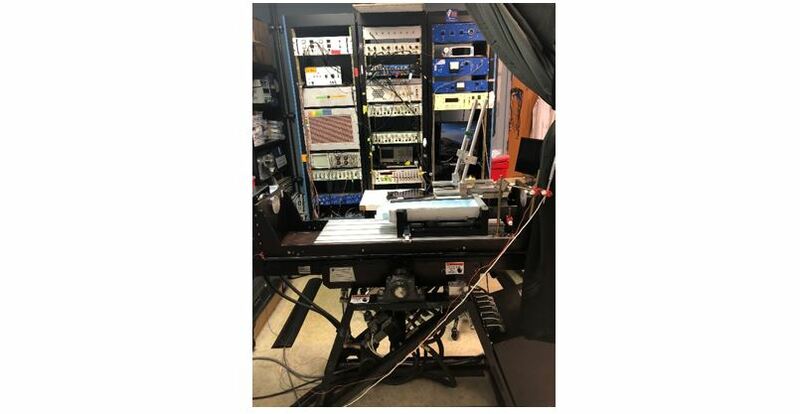 The experiments in the lab involved recording the activity of neurons in the RVLM during imposed 40º head-up tilts that were preceded by a light cue. The light cue occurred 10 seconds before the 40º tilt, and the heart rate and firing rate of neurons were determined for 5 second time periods before and during the tilts. 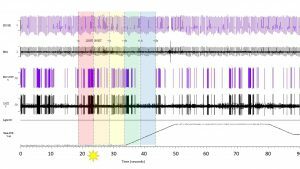 Our hypothesis is that in neurons that exemplify cardiac related activity there is an increase in neuronal activity prior to the onset of the 40º imposed tilt, in the time interval after the light stimulus as compared to before the light. This would indicate that when the animal is able to anticipate when the change in posture is about to occur, the animal’s cardiovascular response system will increase heart rate and blood pressure to prepare for the postural change. This would be an example of a feedforward mechanism rather than a feedback. In a feedback mechanism, the animal would have already undergone the change in posture and body positon in space before the cardiovascular response system could compensate heart rate and blood pressure. This research project will ultimately further our knowledge of cardiovascular homeostasis and may lead to new treatment options for orthostatic hypotension and also a treatment for cognitive mechanisms that can cause changes in blood pressure such as stress and anxiety. Figure 1: An example of the data that was collected and analyzed during one of the tilt table experiments. The x-axis shows the change in time as the table went from a nose down position, to a 40º head-up tilt. The neuronal firing was isolated along with the heart rate through the use of an EKG. 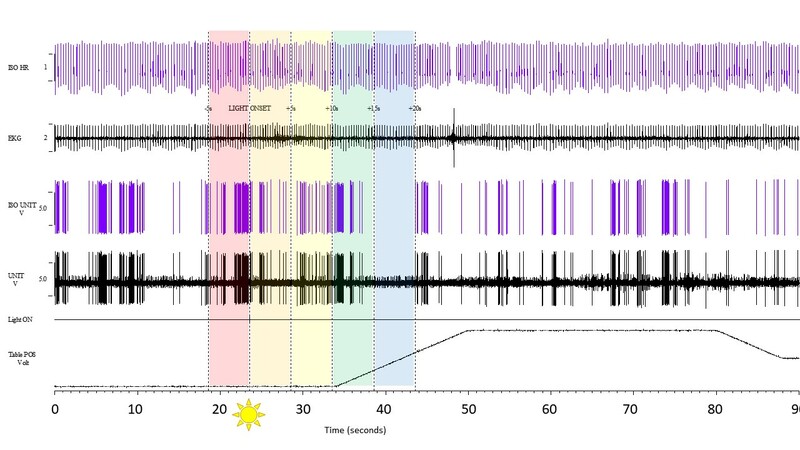 The sun cartoon indicates when the light stimulus was shown with the five second time intervals appropriately labeled before and during the head-up tilt. Credit: Dr. Bill Yates’ Lab, UPMC Department of Otolaryngology. I was extremely grateful to take part in this research opportunity this summer as it really allowed me to grow as an undergraduate researcher. The reality of research is that you get out of it what you put in. If you’re motivated and passionate about what you are doing, then I believe that anyone will be satisfied with the outcome of their experience. I became enamored with learning about physiology after completing Dr. Yates Honors Human Physiology class. After completing his course, I was eager to investigate what research was like on the physiological spectrum. Over a course of 10 weeks, I completed dozens of experiments and analyzed large amounts of data. We performed single-unit in vivo recordings using electrophysiological techniques and procedures. When experiments ran to completion and a respectable amount of usable data was collected, the day was considered successful. Another reality of research is that not every experiment is going to go as planned. There were experiments where either the animal wasn’t cooperating on the table, an electrode bent, or we just simply couldn’t isolate any good neurons to record from. When problems like these would occur, we would simply end the experiment and try again the next day. Because there are a great deal of experiments left to perform and more data analysis to complete, there are no final results or conclusions yet to be made. However, we do predict that the firing rate of the cardiac-related neurons will increase after the light stimulus is given, prior to the onset of the tilt. Figure 2: The tilt table that is used in all of the single-unit in vivo recordings. During an actual experiment, the curtains would be drawn and the lights would be dimmed to allow for the light stimulus to appropriately work. The machines in the back are used to find and isolate a neuron in the RVLM and to change the position of the table. Credit: Dr. Bill Yates’ Lab, UPMC Department of Otolaryngology. I sincerely enjoyed my daily routine as a scientist in the Yates lab. I was able to set my own schedule and I developed meaningful friendships with everyone I worked with. It was a very-low stress working environment and most days I would follow the same routine. A huge part of my project this year was analyzing the data collected from the experiments. When I wasn’t running any experiments I would be on the computer analyzing large amounts of data. Analyzing data is something that a lot of undergraduate students have trouble with, mostly because it takes a lot of time to learn and pick up. I was very surprised by how quickly I was able to pick up the skill and it allowed the lab to make huge amounts of progress throughout the summer. My fondest memory of my time in the lab didn’t actually happen in the lab. On a Friday afternoon after work, everyone in the lab went out to a Pirates game at PNC Park in Pittsburgh. It was my first one and it was really fun to see everyone outside of the lab doing something together. Overall, I had a great summer and I’m very thankful that APS gave me the opportunity to see what full-time research was actually like. This summer experience was very rewarding and has motivated me to pursue my continued interest in biomedical research. Yates, B. J., P. S. Bolton, and V. G. Macefield. 2014. Vestibulo‐sympathetic responses. Compr. Physiol. 4:851–887. 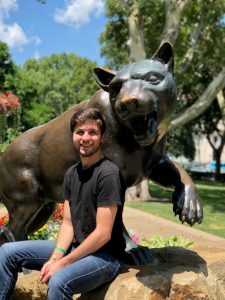 John Bielanin is a rising senior majoring in Neuroscience and minoring in Chemistry, with a certificate in Conceptual Foundations of Medicine at the University of Pittsburgh in Pittsburgh, PA. He is a 2018 Undergraduate Summer Research Fellow working in Dr. Bill Yates’ lab in UPMC’s Department of Otolaryngology at the University of Pittsburgh. John’s Undergraduate Summer Research Fellowship (UGSRF) is funded by the American Physiological Society. Outside of school and work, John enjoys reading, writing music, and spending time outdoors. After graduation, John plans on applying to medical school while continuing to pursue research opportunities in his gap year. Hey John, this was a really enjoyable read! I found your research particular creative because it looks at both the cardiovascular response and the corresponding neural components in a very interesting research model that I never would have considered. And yet, it all sounds promising and important for many different conditions. 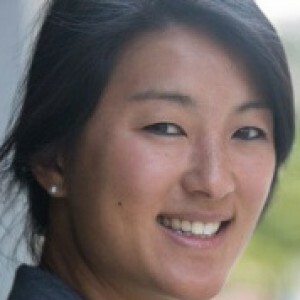 I also agree with your message about needing to be passionate and self-motivated in research in order to be productive. Keep up the good progress and best wishes.